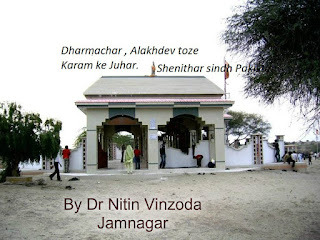 The Sacred Shrines of the Shree Matang Dev, Shree Lunang Dev, Shree Matai Dev and Shree Mamai Dev are located in Sindh now in Pakistan, Historical Holy book on The Shrine of the Maheshwari Meghwar Sufi Saints of Sindh is written by a great Maheshwary Scholar Dr Mohan Dev Raj Thontya from Sindh,He written perfect and true history of Meghwar Sufi saints of the Sindh in Era or ruling period of Soomara Rajput and Sama dynasty Rajput kings of Sindh in The History of Sindh, .He is a professor in Sindh University of history department in Sindh,Greenwich University of Karachi and this holy historical book is published by Govt of Sindh director of Sindh archives and information department Sindh. 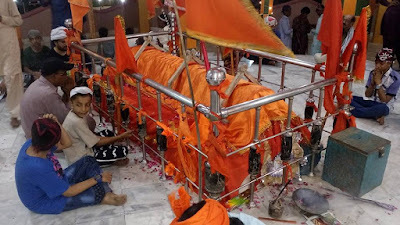 Maheshwary Meghwar Sufi Saints of Sindh. 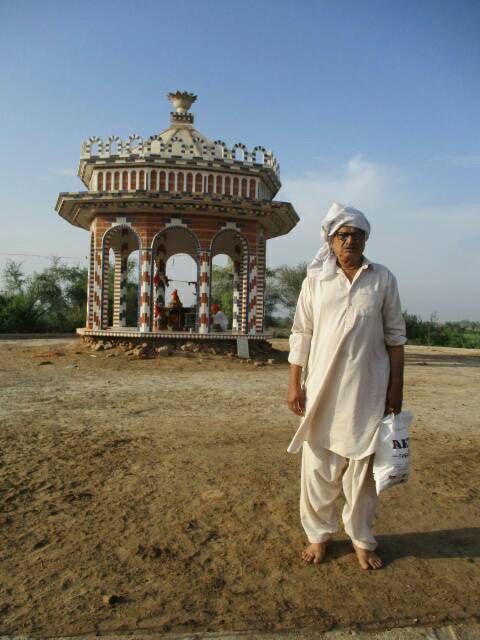 The Shrine of the Lurang Dev In Tharai Sindh. (2) The Lunang Dev Dada was the Son of the Shree Matang Dev. The Lunang Dev Shrine is Located in Village Tharai Dist Badin ,Sindh which is Historical ruined of Soomara dynasty were Hindu and ruled over Sindh and their Capital of State was Historical Tharai, the Lunang Dev and Soomara warriors were Gaman or Disappeared in the Tharai Sindh. (3) The Holy Shrine of the Matai Dev is located in Haji Savan, Ghelro jo Goth, village Bhadra District Badin Sindh. The Matai Dev was believed that he was incarnation or Avatar of God of Ayurveda Medicine in India,the Matai Dev treated Patient which suffering from disease poor people of India in 12th Century. 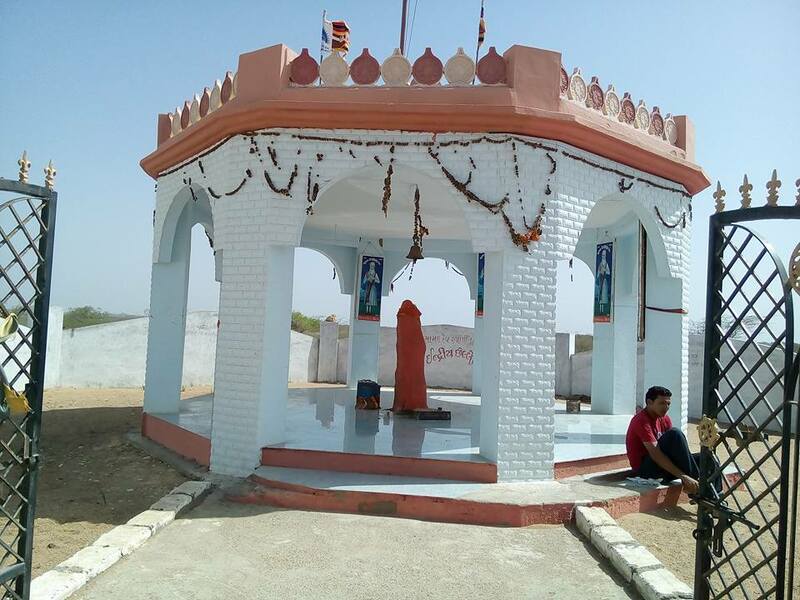 (4) Mamai Dev was Grand son of Lunang Dev, He was Born in Kutch Gujarat Village Matarai near Anjar Town Kutch in Sake 1311,Sangath Choth Vedas:- Sake 13 termu NE varas 11 agiyarmu,mas vaisak Ne tithi Andhary Sangath Choth teni Gur Gamtero kiyo. He was Social Reformer and sacrificed his life for Welfare of Downtrodden poor Meghwar Community of India and Pakistan Sindh and he was a great Sufi saint, philosopher and future predictor in 14th century and preached to poor Maheshwary Meghwar Community in Sindh, Pakistan and Gujarat,and Bihar states of India and others states of India and during Sama dynasty of Sindh and Thatta city of Sindh was capital of Sindh and ruled by Sama Rajput of Sindh. 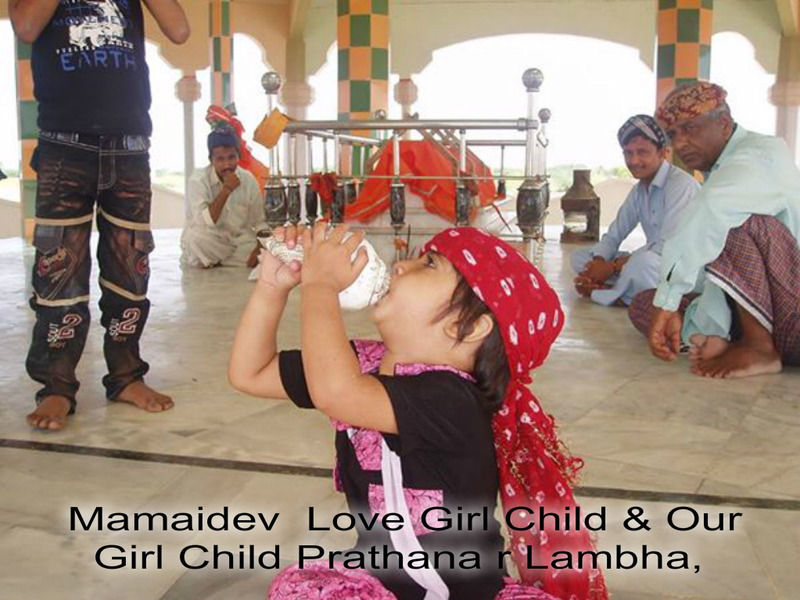 The Mamai Dev was beheaded by king Bamania Sama dynasty of Thatta city Sindh, and performed last journey fro Thatta city to Makli graveyard which is UNESCO World Heritage Site known as Makli Necropolis in Thatta Town of Sindh,The Mamai Dev Hold his head in both hands of Arms and uttered Nine 9 Lacs Vedas to Maheshwary Meghwar community his journey 9 Km from Thatta city to world's largest necropolis, Grave yard and UNESCO World heritage Site. He Disappeared in Earth after 3 Days. We pay Homage to great Maheshwary Meghwar Saints. 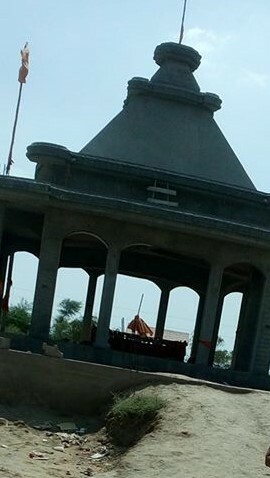 We are thankful to Dr Mohan Dev Raj Thontya a Scholar of History and his great efforts to Adding these Historical Shrine of Maheshwary Meghwar Sufi saints in the history of Sindh. 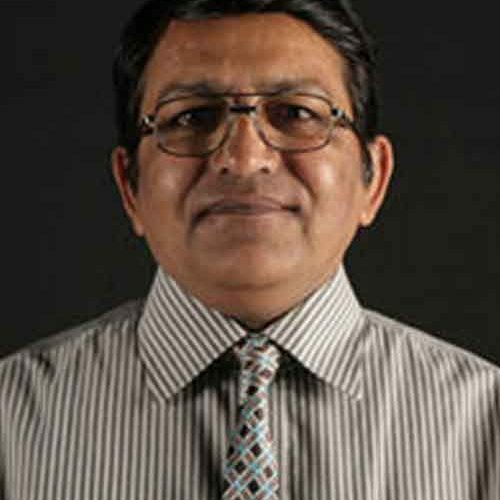 The Dr Mohan Dev Raj is a Jewel of our society and he accrued the Meritorious deed on Dharma and finished Task and Rewrite the History of Four Pilgrimages or Tirth Yatra Dham of Maheshwary Meghwar Sufi Saints in Sindh. The Harshi Vinzoda was devotee of the Mamai Dev, he was with Mamai Dev up to end of his life and Worshiped to Mamai Dev and served with faith to Mamai Dev and he was a care taker of the Dada Mamai Dev and witness of End time of the Mamai Dev and the Vedas of the Mamai Dev preached for Dharma to Maheshwari Community and his Followers of Sindh at last breath and moments of the life. 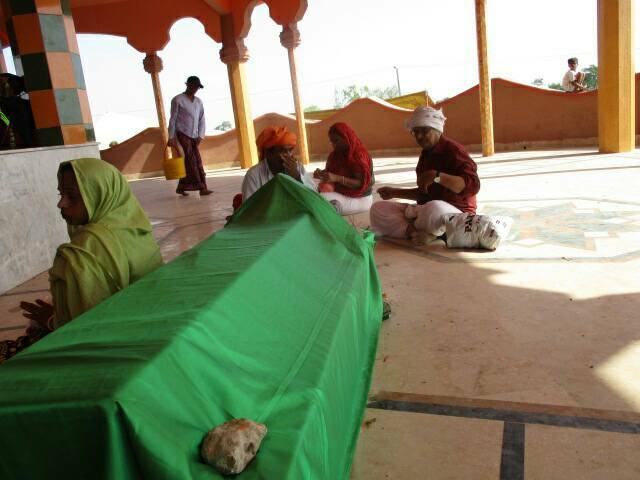 After death of Dada Harshi Vinzoda his dead body was Buried in flank or Rt Side of Grave of the Mamai Dev. 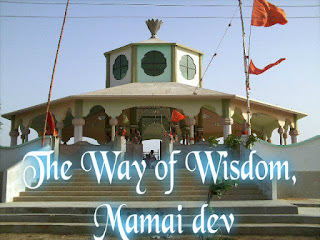 ( shri Harshi Vinjora ko Dada Shri Mamai dev Ki Baho me dafnaya gaya hai) for the memory of the a great devotee of the Mamai Dev. Beheaded Shri Mamai Dev started last journey from Thatta city capital of Sindh to Makli Graveyard 12 km from Thatta City with his head in his hands and walked and uttered 9 nine lacks Vedas. 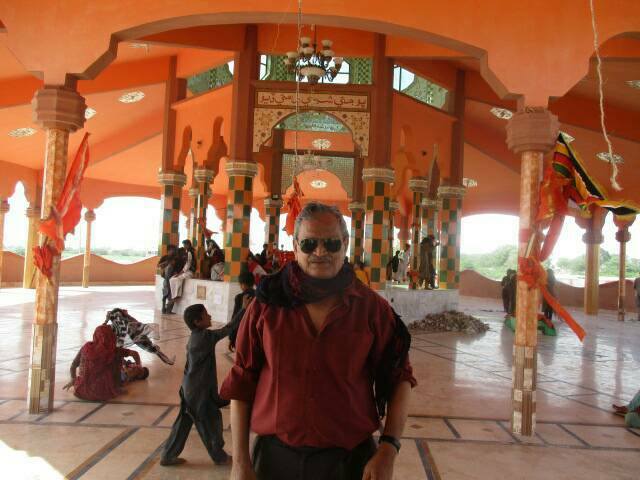 And finally after 3 Days the Mamai Dev disappeared in the Earth of Makli Thatta City Graveyard. Now Makli Grave yard in Thatta City of Sindh.,Pakistan is world's largest necropolis, World heritage Site and 125000/ graves and Tombs are in Makli, Sufi saints, philosopher and kings princes are buried in Makli. 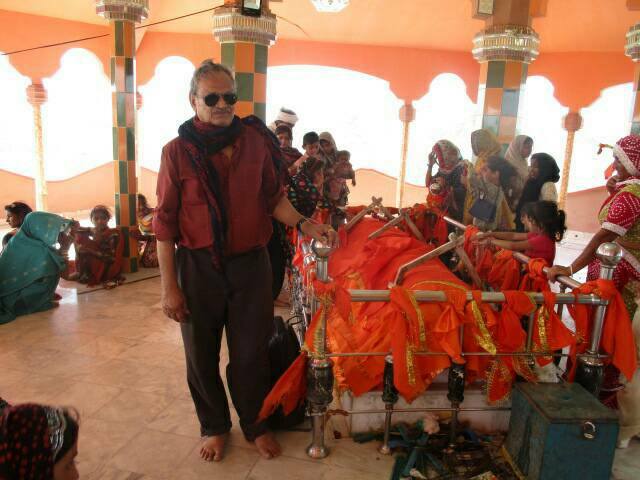 The Grave of our Dada Harshi Vinzoda Grave is Right side of the Mamai Dev Grave in the Holy Shrine. UPERKOT - Fort is an impressive fort located on a plateau in the middle of town. It was originally built in 319 BC. Visitors enter the fort through a large gate. Some parts of the fort’s walls are 20 m high. Further down the road are what are believed to be old Buddhist caves, said to be 1,500 years old (dating from before 500 AD). They are carved into the rocky hill and have stone carvings and floral work. There are also the Khapra Kodia caves north of the fort, and the Babupyana caves south of the fort. There is a huge, fifteen-foot cannon, made in Egypt in 1531. 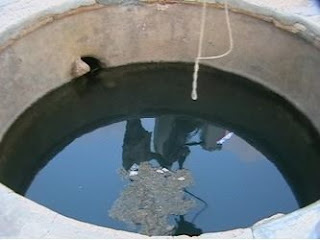 There are also two interesting large step wells (vavs) here. The 11th century Navghan Kuva has a circular stairway that descends over 50 m down into the well. 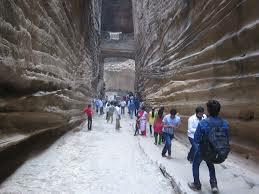 The Adi Kadi Vav descends 170 steps and Local Peoples are believed that You have"t seen a Adikadi Vav and Navghan Kuvo your journey on the Planet earth is useless. Doha in Local Language:--જેને ના જોયો અડી કડી વાવ ને નવઘણ કુવો તે માણસ જીવતો મૂવો મરેલો. The Mamai Dev visited Junagadh and preached to poor Sinbhariya Meghwar and he worked for eradication of caste system and untouchability in India and he was a Social reformer and fought for the human rights of oppression and downtrodden poor Sinbhariya Meghwar, the Mamai Dev formulated a dharma to poor Sinbhariya Meghwar for Education, Unity and struggle. ‘Rao Navghan was informed by one of his royal astrologers Forecast on drought and predicted that there will be a twelve years drought in the Junagadh State and he must take precautionary action for drinking water for the peoples of Junagadh. The king was strongly believed in the prediction of his Rajya Jyotish Astrologer.and ordered to the peoples of Junagadh for to save water, not to use water from the Junagadh’s reservoirs and to save water for Future coming Drought disaster. the Sipahi or Guards of Rao Navghan were checking that on one can draw water from Damodar Lake of Junagadh, and Upperkot/Fort Lakes of Junagadh, the Mamai Dev went to Lake Damodar Kund for his Morning Bath, the Sipahi or Guards stop him for Bath and said to Mamai Dev that this is the order of King Rao Navghan,The Mamai Dev went to meet King Navghan and explain and predicted that there will be no drought in Junagadh state but there will be plenty of Rain and Cloudburst in his state Junagadh,and Mount Girnar and your Junagadh will be Submerged in flood Water and your Mount will be collapse due to landslide and erosion By heavy Rain like Cloud burst and will cause destruction of Mount Girnar of Junagadh,so that we have to take Preventive action for to save your City Junagadh and Mount Girnar due to Heavy Rain. But Rao Navghan denied the prediction of the Mamaidev and he was believed the fore cast of Drought theory of his Rajya Jayotish. 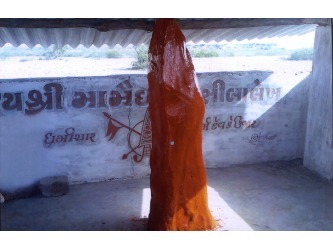 Astrologer Brahman and the Mamaidev went to village DHANDHUSAR ,20 KM near Junagadh city and he worshiped 12 MEGH God of Rain and Alakh dev God for the Rain in Junagadh and end of Scarcity of water the Mamaidev uttered divine Vedas of Megh Mandan ,Megh Malhar / મેઘ મલ્હાર /મેઘ વિનંતી Megh Malhar is Gynan divine Melody or rhyme for pleasure of Rain,which is the prayer to ૧૨ મેઘ /12 Rain God.then Mamaidev went to Mount Girnar and climbed or Mounted Mount Girnar with 12 Meghwars at the Top Hill of Mount Girnar which is known as Guru Datratrey took TOP in local Language,the Datratrey was a Sufi Saint of Girnar Mount and he worshiped at top of Mount Girnar. The Meghwar are the son of God Rain or Megh.due to divine Gynan Song of Mamaidev, the 4 four Lac Various types of Clouds of Rains make it to gather and associated with divine Lightening at Junagadh and Mount Girnar and 84 various types of Lightening started with the loud Thunderstorms with various melodious tone like Musics in the sky and in the valley and top of Mount Girnar and heavy Rain started to fall on the Mount Girnar and Junagadh continue for 3 days,plenty of water Collected lodged in the City of Junagadh, the Rao Navghan feared that that if Mamai Dev would not stop uttering the divine song, the rain would continue to fall and the whole city would be submerged in the flood and his Junagadh city would be submerged in the Rain water and Mount Girnar will collapse with Erosion and landslides of Mount Girnar which leads to destruction of his Kingdom Junagadh. 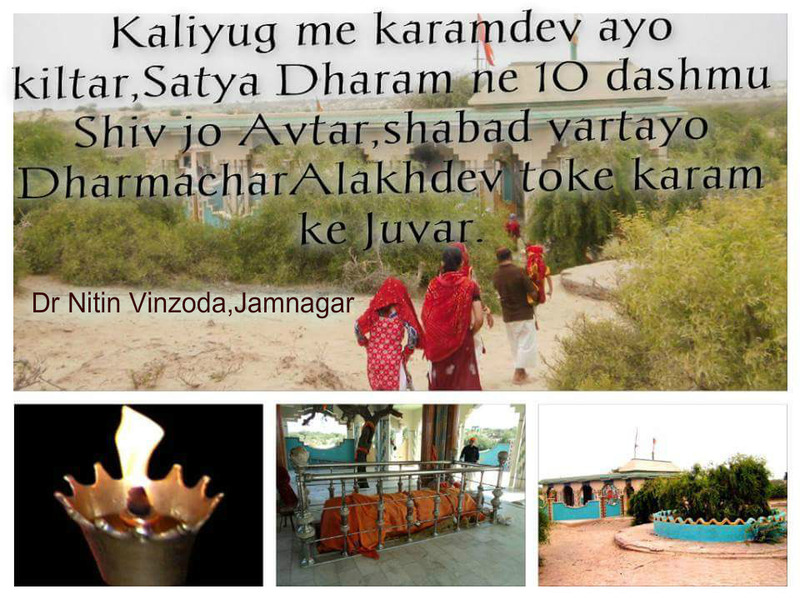 the Mamai Dev was in worship to God Rain Meghraja and Alakh Dev at the Top of Mount Girnar then he opened his eyes and said to Rao Navghan king o Navghan you Go to colony or Vas residence of poor Sinbharia Meghwar of your Junagadh,the MEGHWAR are the sons of Rain Megh,so that Megh rain will stop by the prayers of Meghwar,then Rao Navghan went to poor Sinbharia Meghwar Colony and urge them to pray for stoppage of Rain with Mamai Dev and Mamai Dev request to Meghwar for to stop of Heavy Rain in Junagadh. the Meghwar are the son Of Megh Rain king. He request to forgive for his Mistake not to follow the Forecast of the Mamai Dev.
" દેવ હી તોજા મેઘવાર ને ગુર મામૈદેવ આવ ( navghan ) તોઝો રેક્વાર,ઔવા ભૂલ થઇ મુકે માફ કર બુદ્ધ્રરાજ ..
By Dr Nitin Vinzoda , Retd Superintendent of Govt Hospital Gujarat state, and Occupation health Consultant in Reliance Refinery& Essar Oil Ltd, Adani,MICT Mundra. 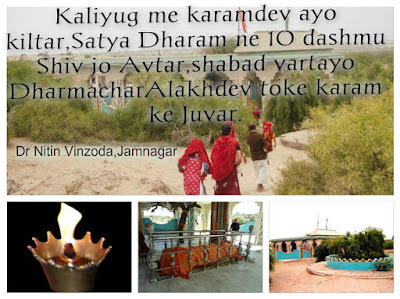 (૧) રૂમસુમ થી ચાન્સી ( કટક) ચડંધી, મળચંદ કેન્ધો હાજ , મામૈદેવ ભણે મહેશ્વરિયા તેર થીંદો પાંજો રાજ, (૨) ૧૮ વરણ એક હકડા થીંદા ક્ષેપ ના પારીન્ધો કોઈ દેવ મામઈ ભણે મહેશ્વરિયા એડા અચીંધા આડ ( દુનિયા ) તે દિન . 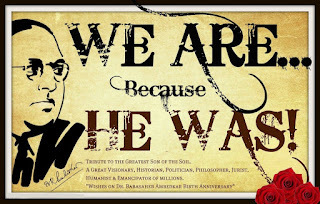 The Dr Ambedkar ( April 1891 - to 6 December 1956 ) ,was a great Philosopher, Social Reformers and Jurist and Political leader of India and Founder and Father of Modern India, the Buddha and His Dharma a Holy Book written by Dr Ambedkar, he fought for human right for Dalits Community of India. Turn in any direction you like,Caste is the monster that that Cross your path,you can not have political reform you can not have economic reform unless you kill this monster,Caste systems. 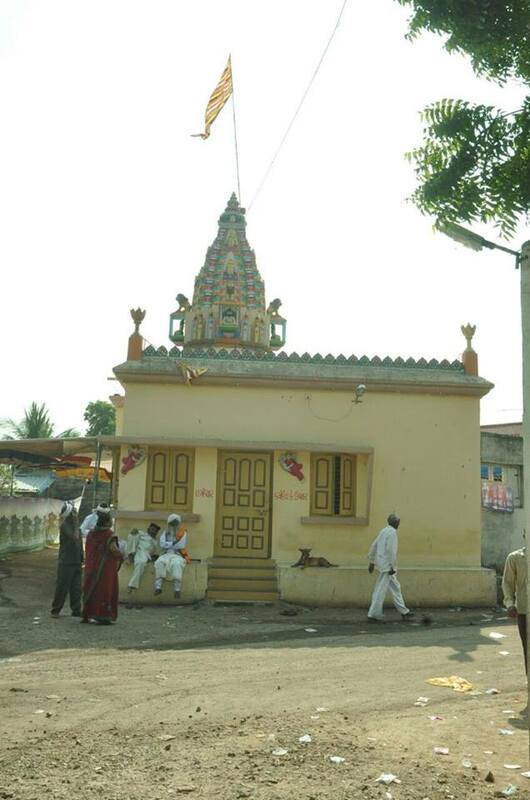 Meghwar were not allowed in the Temples by Upper caste Hindu,Dalit and Meghwar are at the Bottom of the Hindu Caste systems and Despite laws to protect them they still face widespread discrimination in Modern India, Pakistan, Sri Lanka.Nepal and Bangladesh. Untouchability is still Prevail in North India and South India, Bihar, UP and other states of India,and also in Sindh & Punjab Pakistan, Nepal, Srilanka, Bangladesh. The Mamai Dev sacrificed his Life for Uplifting of poor Sinbhariya Meghwar and he worked for Annihilation of Caste In the Post-Vedic period, the rise of Buddhism and Jainism were certainly a reaction against the deterioration of the moral order as against the rights of the privileged class and poor Tribal Meghwar in India, Life was more human and liberal in the Post-Vedic era. After Buddha,The Ashoka was a Meghwar King he ruled all over the India after Buddha period,The Emperor Ashoka protected and secured the most precious of Human rights, particularly the right to equality, fraternity, liberty and Happiness. Ashoka successfully established a welfare State and made provisions for securing basic freedoms. 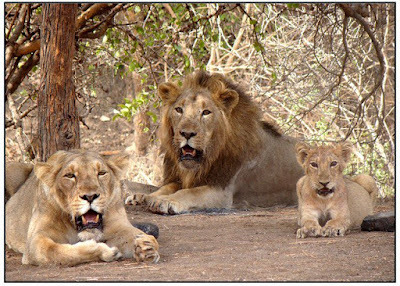 Ashoka, the champion of civil liberties, allowed even the forest folk in his domain to enjoy security of life,independence of mind and enjoy. More than 160 million people in India are considered "Untouchable"—people tainted by their birth into a caste system that deems them impure, less than human. "Dalits are not allowed to drink from the same wells, attend the same temples, wear shoes in the presence of an upper caste, or drink from the same cups in tea stalls,Despite the fact that untouchability was officially banned when India adopted its constitution in 1950. સાથે કચ્છ ના રાજા મુરવાજી તેમના રસાલા માણસો સાથે અહી આવે છે તયારે બધા ને પાણી ની તરસ લાગે છે અહી કયાય પાણી નથી શ્રી મામૈદેવ તેમની કટાર થી જમીન માંથી ગંગા પ્રગટ કરે છે, મામૈદેવ પર મુર્વાજી જાડેજા પ્રસન થાય છે ને મામૈદેવ ને વચન આપે છે કે તેઓ કયારે પણ મેઘવાર પર અત્યાચાર નહિ કરે, આભડછેટ નહિ રાખે મેઘવાર ના ઘર નો વેરો માફ કરશે, આજે મુર્વાજી જાડેજા નો શિલાલેખ મોજુદ છે. The Kadamgiri hill is located in Kadamgiri Valley 35 Km From Palitana Town of Bhavnagar district of Saurashtra state of Gujarat India. 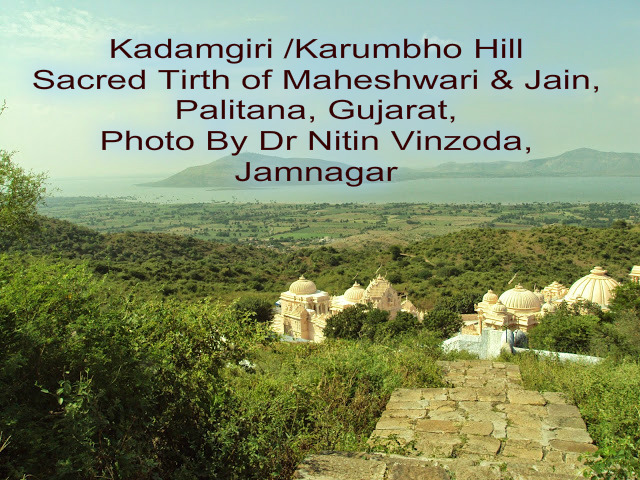 Kadamgiri is also known as Karumbho Mount or dungar in Matangdev dharma of Maheshwary community,the Maheshwari devotee from Kutch, Sindh,Jamnagar,Maharashtra and other Parts of Country are coming at Kadamgiri hill Yatra on Month of Vaisak and Akhatrij which is Nirvana day of shri Matang Dev; Kadamgiri Hill is the Holy Pilgrimage of Jain and Maheshwary,The Matangdev was 10th Avatar or Incarnation of Lord Shiva,he preached to poor Sinbhariya Maheshwari Meghwar of Sindh,Gujarat, Maharashtra and MP states of India. the Neminath Lord preached to Jain in Jainism before 2500 years ago.The Matangdev was Born in 9th Century in Bihar patliputra state of India and he had done welfare of Tribal Meghwar community of India he preached for Dharma and Equality and Unity and struggle in Life,He always preached for Unity in Community,The Matang Dev fought for dharma,His followers were Maheshwari, Shamma Rajput of Sindh and Sumara Rajput Community and Kings of Sindh and king of Gujarat,the Matang Dev fought a war with a Bhimsingh Chavda a king of Gujarat, the Matang Dev defeated Bhim Singh Chavda and Matangdev married with Shekhdevi she was a Princess of Bhavnagar state of Gujarat and Daughter of King Punsinh Gohil. Gohil dynasty. Every Religion have its own Identity ie there are Janoi/ Sacred thread in Hinduism and Sunnat or Circumcision in Islam and Jews,It is known as Diksha in Buddhism and Jainism, the Matang Dev given sacred Barmati Panth dharma to Maheshwari and given neem kangan to Maheshwari for firmness in his dharma and its own identity as Maheshwari. (૧) ૯ નવ કોડી (લાખ) માનવી ગની ને કરમ દેવ કારુભે ચડીયો,તે મંજા ત્રણ કોડી તર્યા, ૬ છ કોડી હરી જે વિશ્વાસ તે ના હાલિયા ,દેવ મામૈદેવ ચે સે જીવ ખૂટી ને કાદવ મેં પડિયા. (૨) જકી જીવ કદમગીરી કારુભે તે નીમ્યા ( નીમ કંગન ) તેનકે વેરા ( દુખ) જો ના અચે હૈયાન ,૩ કોડી માનવી ગત જા કંગણ કારુભે તે ભરિયા તેનજી વગત કન્થઈ મામૈદેવ પંડિત વછવાર. (3) જી જળ મેં શરીર pandhi પખારીઓ ( સ્નાન) તી બારમતી ઈ જીવ જો પખાર મામૈદેવ ચે જકી જીવ કારુભે તે કંગણ ભર્યા તેન્જા ઉતર્યા જીવ જા કસમર ભાર.. 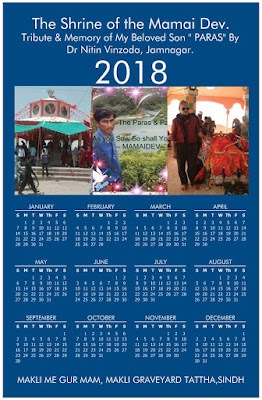 The Mamai Dev On Pure Body Pure Mind/ "Pandh Shuddh Jiv Shuddh"
Dhammachar is basic pillar of Mamaidev and his dharma he given 36 vows to Maheshwari,Meghwar. (3) Enlightenment is unsurpassed : I vow to attain it. Dharma and Karma provide the basic for Mamaidev dharma morality, but also influence the religion's concept of justice.They form a cosmic path that guides the soul through reincarnation and toward the ultimate goal of Enlightenment.This is possible because the two concepts are connected, with dharma teaching individuals to live in harmony with the world, allowing them to accrue positive karma and experience favorable events in this and the next life. Dharma is a kind of self-evident truth in Mamaidev Dharma and Buddhism.It is the natural state of all things,and adherents come to know it through study of Mamaidev"s Sacred Scripture and Buddhist scripture also; Dharma unifies the Mamaidev Dharma & Buddhist principle of the Four Noble Truths,which teach: the existence of suffering, the origin of suffering, the cessation of suffering and the path to its cessation.Karma,on the other hand, is a natural causal force It pervades the cosmos and guides the soul through its many lives.It teaches that every action has a consequence and every decision has an outcome. These are the Basic pillar of the Mamai Dev and his Dharma for the peace and happiness of all Living beings of the world.the Mamai Dev preached to Maheshwari and kings of India for Filial piety means to give respect to your parent and elder peoples and help them and do not forget of your parent you worship only your Mother and father they are real god for worship you do not worship Idol or Stone made sculptured god,they are only stones. you worship only Living persons; and help those who are poor helpless and Orphans the god resides in these person these are the Compassion and your Wisdom.The Mamai Dev said in his sacred Scripture " Pandh Shuddh Jiv Shuddh". The Mamai Dev represents peace and Equality with compassion and wisdom one can generate Merits.To enjoy merit is to build upon the foundation of Equality and Purity;this is the greatest Enjoyment for human beings,to cultivate merits in childhood,generate merits in middle age,and enjoy merit in old age described as truth,virtue and Beauty. 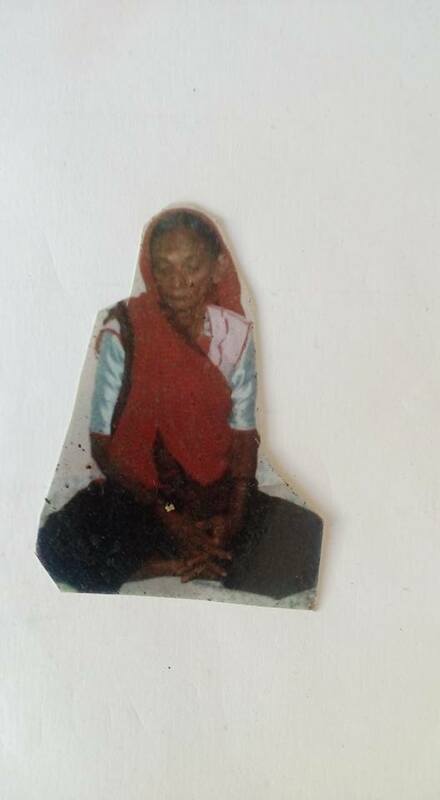 THIS SITE IS TRIBUTE TO MY GREAT MOTHER *** Jethi Ben.
" I ONLY BELIEVED IN KARMA"
I Tribute to all Mothers of all World Human being and Non Human beings or all Sentient Beings, Living beings.To those who are Mothers themselves; to the Mothers of all of us—to whom we owe our lives, and to the loving mother within you—within all of us. 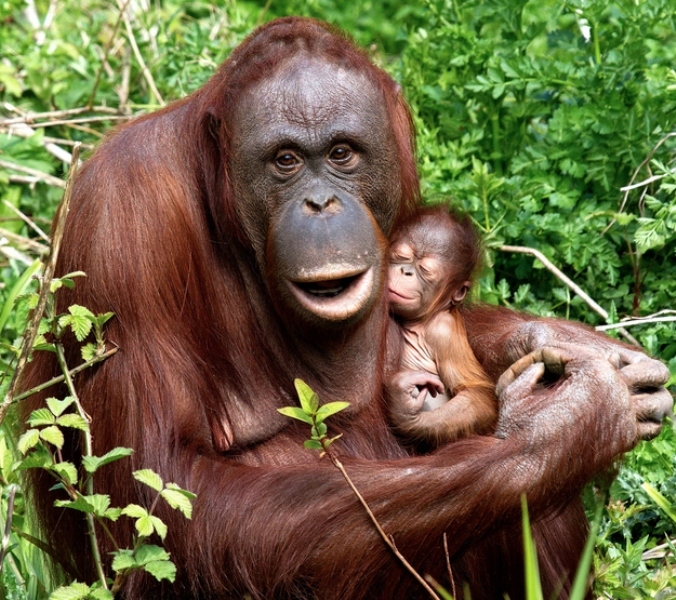 If we share more than fifty percent of our DNA and GENES with our Loving Mothers,Many of good karma are transmitted from the Genes of Our Mother to their Child,the living beings are Cultivated in the Womb of their Mothers whether they are Human or Animals and Birds, every sentient beings on the Earth they loves their Mother, imagine how much all of us of every gender share the karma or the capacity for loving Mothering! Mother is everything for us when we are small ..our life revolve around her.for everything that we need we call Mother.To Protect from all perceivable dangers we want her around us.To take us out we hold her arms.To kiss away our wound we run to her and for a warm Hug and Love we look for her.she is a focal Point of our lives,Mother is a Beautiful Creature of the God, the Mamai Dev Said the Mother is God there is no Gods greater than Mother,Mother is the greatest human Beings in the world or should we say divinity on the Planet Earth. The Mamai Dev said that Mother is equal to GOD if you have Loving Mother first you see the face of your mother there will be all sins are wiped out,there is no need to believe in Idol God, every things are in the feet of your Mother. O Mother nothing could be better than you, I do not know another Heaven but I know my Heaven is in the feet and hands of my Mother, O Mom Mother We Love you,you show me your face in any forms and grant me to penetrate your heart. the Mamai Dev said in his karnavati Vedas:- "BACHPAN ME MONJI MAA NA MARE" O GOD DO NOT KILL MY MOTHER IN MY EARLY CHILDHOOD. 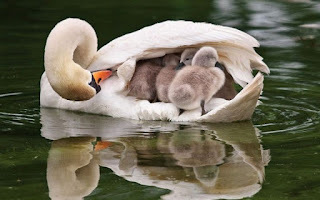 "O God if you give promise to me not separate me from my Mother in the Re Birth on the earth and for my childhood you promise that i will not lost my Mother due to early death of my Mother, otherwise please do not give a birth on the earth without my mother. To all those on the Path who are doing so, and who will do so—my tribute. To those of his great disciples—my tribute. To awakening itself, its factors, its folds, and its training—my tribute. And to those who find the Way themselves by their own merit and this very special capacity of being human—my tribute.